Even before the publication of last night's Saudi trial balloon hinting that the kingdom would soon acknowledge that the extrajudicial killing of Jamal Khashoggi - the insider-turned dissident journalist who walked into the Saudi consulate in Istanbul last week and never walked back out - was the result of a "botched" kidnapping attempt carried out by "rogue killers" (despite reports that the US intelligence community knew that Khashoggi was being "targeted"), two realities had become increasingly clear. One: That the Saudis would avoid responsibility for the killing by pinning it on some unfortunate underling, and two: that there would be few, if any, lasting diplomatic repercussions. And as more media organizations confirmed reports about Saudi's plans to spin Khashoggi's murder as a botched interrogation (we can only imagine what was said in that room to justify the use of such extreme violence), CNN calculated the Secretary of State Mike Pompeo met with Saudi King Salman in Riyadh for approximately 15 minutes early Tuesday, following his 12-hour-plus flight to the kingdom. 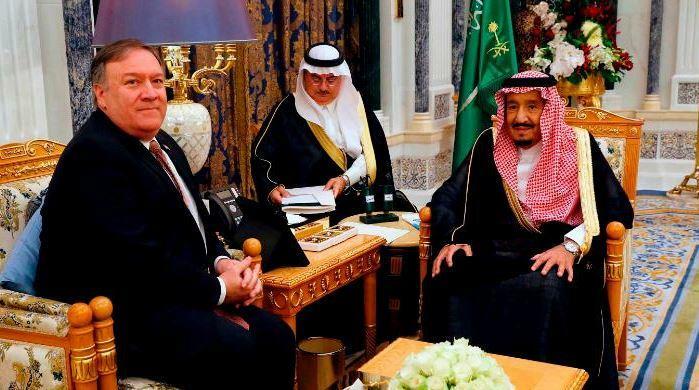 US Secretary of State Mike Pompeo’s meeting with King Salman of Saudi Arabia lasted no more than 15 minutes, CNN estimates based on the time the top US diplomat’s motorcade arrived at the royal court and departed. The motorcade arrived at the royal court at 11:42 a.m. (4:42 a.m. ET) and left 26 minutes later. There is a fair distance to walk from where the motorcade dropped Pompeo off to where he met the king. While Trump said on Monday that Pompeo would travel to Turkey "if necessary", the Saudi's decision to "come clean" about Khashoggi's death pretty much rendered Pompeo's fact-finding mission unnecessary. More important are developments in Turkey, where the joint Saudi-Turkish "investigation" is turning its attention toward the home of the Saudi consul, where a black diplomatic van that departed the Saudi consulate just under two hours after Khashoggi entered was captured on camera disappearing into a garage. Some speculate that this is where the killers finished disposing of Khashoggi's body. This comes after a "nine-hour" search of the Saudi consulate building that, according to leaks published in Al-Jazeera, turned up "evidence of tampering" by the Saudis. On Tuesday, Turkey's foreign minister clarified that Saudi had yet to admit its role in Khashoggi's disappearance and probable death. Turkish investigators will carry out a search of the Saudi Consul General’s residence on Tuesday as the probe into the disappearance of journalist Jamal Khashoggi continues, according to a Turkish diplomatic source. CCTV footage released to the media from the day the Washington Post writer vanished show movement of vehicles from the consulate building to the Consul General’s residence nearby. 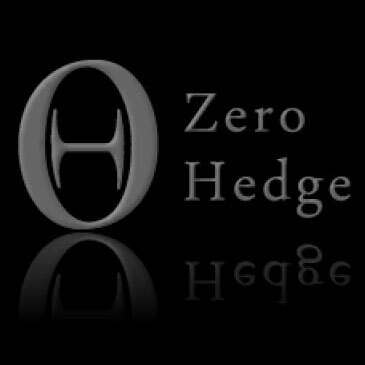 As speculation mounts that the incident could unseat the increasingly authoritarian Crown Prince Mohammad bin Salman (who has already marginalized or incapacitated nearly every threat to his rule), it's looking more likely that neither the US nor the rest of the Western world will do much to punish the world's most important oil exporter, which can "weaponize" the oil market seemingly on a whim. The economic strategy of Saudi Crown Prince Mohammad bin Salman, known as MBS, is to make investment the main engine of economic growth instead of government spending, but the disappearance of Saudi journalist Jamal Khashoggi could frustrate these ambitions. Foreign direct investment, a key part of the plan to reinvent Saudi Arabia’s economy, declined sharply in 2017 and is unlikely to return to previous levels, leaving the government’s target for 2020 beyond reach, according to analysis by Bloomberg Economics. Increased policy uncertainty and, after the Khashoggi incident, the risk of reputational damage to foreign companies working in Saudi Arabia won’t help. 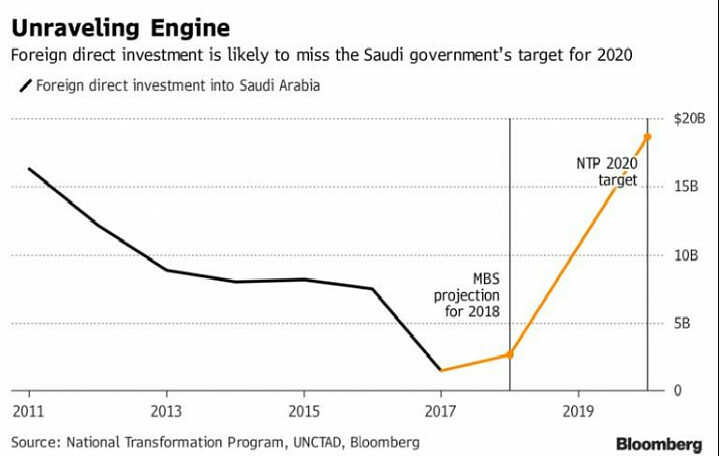 Already, BBG believes FDI in KSA will miss the regime's target for 2020. As if to underline this point, CNN reported that three more prominent bank CEOs said Tuesday that they would pull out of MbS's "Davos in the Desert". At this point, so many have spurned the conference that CNN felt it would be easier to list the attendees who haven't already cancelled.